Genus Glycine includes some wild and one cultivated species. In global agriculture, Glycine max L. Merr. holds the first place among other grain legumes. It has major importance as an oil crop, high-protein human food, as animal feed, medicinal and industrial plant, and as a fertilizer. Until comparatively recent times cultivated soyabean has been grown almost entirely in the countries of Asia. 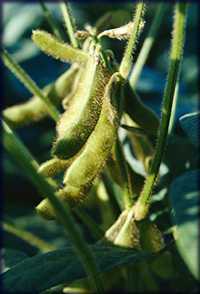 By now, soyabean has become a major crop in North America (USA , Canada) and South America where it occupies over 70% of total areas under this crop in the world. Europe has only about 2% of world areas under soyabean. Nevertheless, a number of European countries have the highest yield of soyabean in the world: Italy, Switzerland, France, Greece, Austria. Many www perspective soyabean varieties have been bred in European countries. Genebanks of Europe maintain rich germplasm collections of genus Glycine. By preliminary estimates, they comprise more than 20,000 accessions. The largest collection numbering more 7,000 accessions is maintained at the VIR. The European Glycine Database was established on the initiative of the ECP/GR at the meeting in Copenhagen, 1995. It is maintained by the VIR. The European Glycine Database has a purpose of uniting information about representation of the world soyabean diversity in European genebanks. The sroucture of the database follows the principles of the IPGRI/FAO Multicrop Descriptors List. Seed request should be send directly to the holdind Institutes/Genebancs.